UPDATE: The red variant pictured above appears to be a photoshopped version of a previously-leaked render. As a result, it seems as though there will be no red model for the Asian market. It was reported last month that the red Galaxy S10 variant had been scrapped entirely. Since then, this claim hasn’t been disputed as there has been absolutely no sign of the long-rumored model. But today a leaked press render has appeared online suggesting Samsung may have had a slight change of heart. Set to be marketed as Cinnabar Red, the colorful variant’s availability and release date currently remain a mystery. However, from the look of things, it will only be available to a limited group of consumers. As things stand, industry sources maintain that Samsung has scrapped the red model of its flagship lineup. As a result of this, it seems likely that the red version of the Galaxy S10 will be available only in a handful of Asian markets such as South Korea and China. This expectation is backed up by the anime-themed wallpaper and the fact that the render first emerged in China. 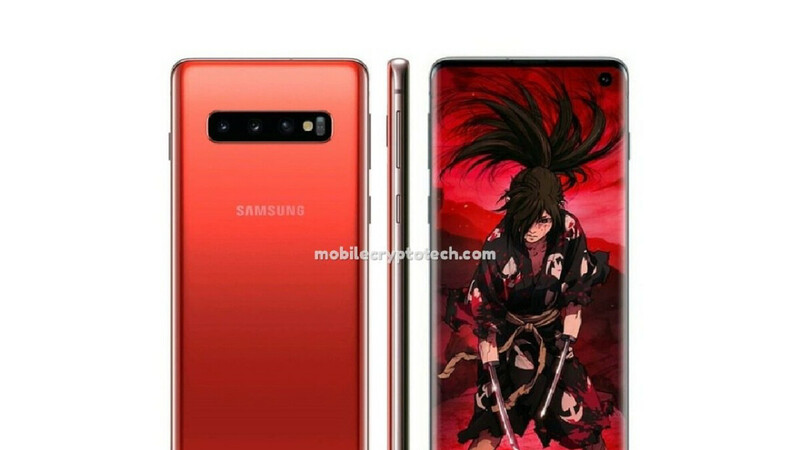 Considering the lack of Galaxy S10+ and Galaxy S10e press renders, it’s possible that the Cinnabar Red color option will only be available to those interested in the regular Galaxy S10. If true, consumers should be able to purchase the device in a 6/128GB configuration or a premium 8/512GB model. Alternatively, Samsung could limit the color option to just one of these. Presumably, the red Galaxy S10 won’t be available to purchase immediately. Instead, the South Korean giant will probably push its black, green, and white models first before releasing this extra model at a later date in order to boost sales. I like the s10e's design better honestly. If you like it better then good for you. Many will like the plus version better. Isn't choice great? Hope they release the Burgundy color at launch. Don't like red but it's a nice design. Is it called " communist china red"? You can have it a loyalty to the party symbol. Very nice color, but I bet its coming to the USA. Sammy always delays or doesn't bring many colors. Read the article before you comment next time. Hyakkimaru wallpaper is just make it more PERFECT!